As one of the UK's leading gaming laptop manufacturers, it was no surprise that Rock was the first to use nVidia's SLI graphics technology in a laptop back in March. Still representing one the most high-powered mobile gaming options is the Rock Xtreme SL. Measuring 477x340x57mm, the Rock is fitted with a 19-inch Super-TFT screen. With a weight of 7kg, the chassis is unsuitable for travel use. However, measuring 42mm at its narrowest point, it is far slimmer than we thought possible for an SLI laptop. For optimum gaming, twin nVidia GeForce Go 7800 GTX graphics cards are used. Running side-by-side via SLI technology, only the Evesham Quest Nemesis can match its high-end gaming ability. Effortlessly running all benchmarks, the Rock scored a huge 5309 points from 3DMark 2006. With such high performance, even the most demanding of modern games can be played. Adding to the gaming power, the WSXGA resolution of the 19-inch screen provides stunning images. Providing the potential for future upgrades, if Rock chooses to offer the option, the chassis can support an upgrade to a 20-inch screen. Inevitably the Rock is highly-specified. An AMD Turion 64 ML-44 processor runs at 2.4GHz, with 1024MB of DDR SDRAM in support. A 100GB hard drive provides ample space for running games from disk, and spins at 7200rpm. Since MobileMark tests require a minimum battery life of 90 minutes, the 82-minute battery of the Rock was just too short. However, this is more power than expected for such a large chassis. To further save power on the move, the SLI technology can be disabled via an easy access software interface. Reducing graphics to using one nVidia card, extra battery life can be gained, with a 40 per cent drop in graphics performance. The user-interface is high quality throughout and comfortable to operate. Professional gamers can add an external mouse and keyboard with ease, thanks to the five USB 2.0 and one PS/2 ports available on the spacious chassis. Inevitably, high-speed networking is provided via 802.11g Wi-Fi and Gigabit Ethernet. 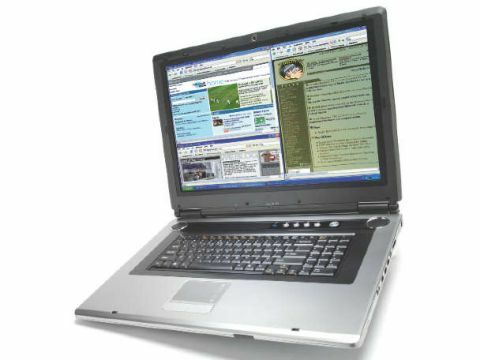 Adding to the multimedia ability of the laptop is a dual-format recordable DVD drive, webcam, digital TV tuner and integrated subwoofer. With impressively high performance, the Rock Xtreme SL is as powerful a multimedia laptop as you could wish for. Although recently bettered by the increased power and lower price of the Evesham Quest Nemesis, the Xtreme SL is still a market leading gaming laptop.